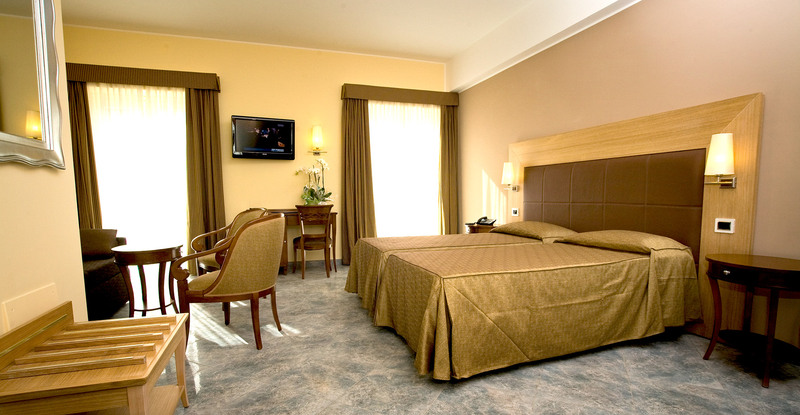 Single rooms are elegantly furnished and comfortable for experienced travelers. Soundproof room, tile floor, hypoallergenic toiletries, private bathroom with courtesy accessories, shower stall, hair dryer and slippers. Room size is 14 sq meters and has a single bed. The room has an external balcony, TV LCD cable Sky Vision, Pay to View, high velocity Wi-Fi, minibar, telephone, telephone wakeup alarm, safe box for PC, air conditioner, desk. Very comfortable and cozy atmosphere to make your stay pleasurable. All Classic rooms accommodate double or single use, twin or matrimonial arrangements. Sound proof room, tile floor, hypoallergenic toiletries, private bathroom with courtesy accessories, shower stall, hair dryer and slippers. Room size is 23 sq meters and has a King size bed. The room has an external balcony, TV LCD cable Sky Vision, Pay to View, high velocity Wi-Fi, minibar, telephone, telephone wake up alarm, safe box for PC, air conditioner, desk. 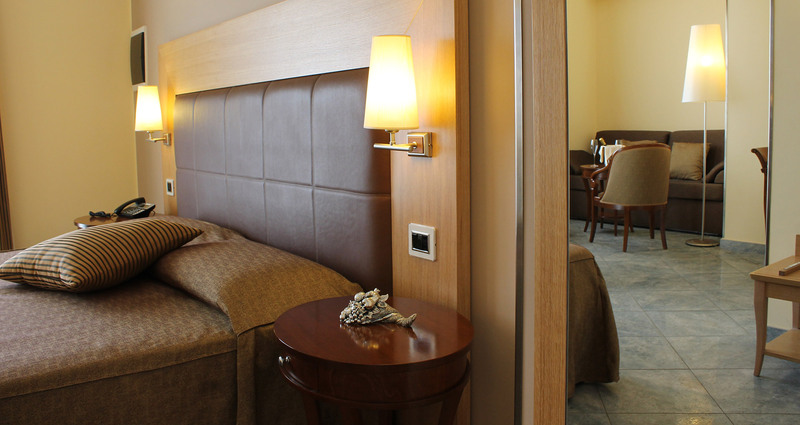 Elegant and spacious to offer maximum comfort and relaxing for a special stay, as well as, for a small family. Designed with entry foyer and living room. These rooms are situated on the top floor with lovely views of the gardens and the medieval fortress wall of historical Tarquinia center. All Superior rooms can accommodate double or single use, twin or matrimonial, triple or quadruple. Sound proof room, tile floor, hypoallergenic toiletries, private bathroom with courtesy accessories, shower stall, hair dryer and slippers. Room size is 27 sq meters and has King size bed, couch- pull out bed. The room has an external balcony, TV LCD cable Sky Vision, Pay to View, high velocity Wi-Fi, minibar, telephone, telephone wakeup alarm, safe box for PC, air conditioner, desk. Refined and intimate atmosphere, with contemporary Libery style funishings, this is the choice for a luxurious stay. Situated on the top floor, with spacious entry way and living room that has a 360 degree panoramic view of the area that will make your stay unforgettable. Soundproof room, tile floor, hypoallergenic toiletries, private bathroom with courtesy accessories, shower stall, hair dryer and slippers.